We had seen several of Jason’s houses and heard his local reputation, and he did not disappoint. He listened to our vision, worked with our plans, and completed the job on time and within our budget. When working on our project, Jason was on the job site every day, displayed a positive attitude, and was always available to discuss our changes or concerns. Jason has an eye for detail, and he made professional, creative suggestions that enhanced our home. We would highly recommend Jason as an experienced and knowledgeable builder who maintains a trustworthy relationship with his clients. Mr. Jason James of the Albemarle Contracting Services was a super man. I followed him for over seven years before I chose the builder of my Outer Banks home. He listened to me and gave suggestions as well but most important we were on budget and on time. 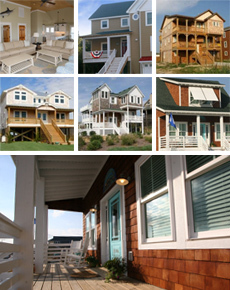 The finished product was on the Outer Banks Parade of Homes and to this day I love the home/cottage. Many of my guests that come a stay comment on the workmanship of the home for they love the little extra items he does on his own to make each home /cottage he builds or remodels to fit the people who will own it. I feel I can call on him at any time and he is there to help me. I will be using his company in the future for a new project.